Whether you are a roller or stroller, you will enjoy this walk along Puerto Vallarta’s seawall (Malecón). From Indians and Aztecs, pirates and Spanish Conquistadores, farmers and fishermen, stevedores and early settlers to Hollywood actors and famous politicians, today’s Malecón continues to hold a special magic over those who meander its two-mile length from Hotel Rosita past the Los Arcos Amphitheater all the way to Los Muertos Pier. The ocean, the waves, the breeze, and the jungle covered mountains only add to the beauty and enjoyment of this important historical symbol of Vallarta. Join this newest walking tour as we stroll or roll the Malecón while learning about the history and local culture of Vallarta, stories of its people, the origins and inspirations behind the many bronze sculptures, significant historic buildings, outdoor art and Huichol Indian symbology that is embedded in the sidewalk. End at the stunning Los Muertos Pier. A list of beach restaurants we pass is included with the walk. This is a two-hour walk, reservations required 24 hours in advance. Book and pay online on Home page. More photos in the Photo Gallery. 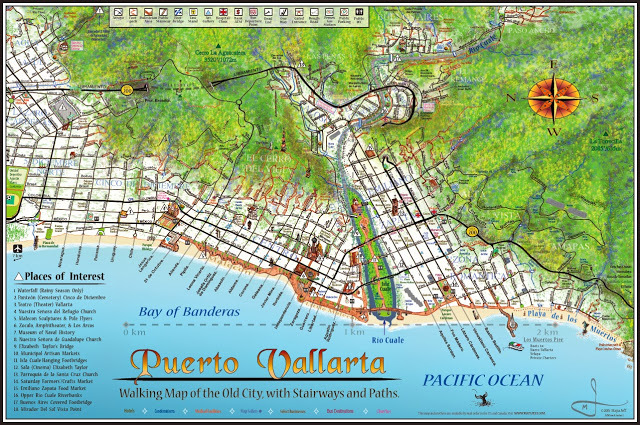 Well-known cartographer Jeffrey Obser, or Mapa Jeff as he is known in Vallarta, continues to produce exceptional hand-drawn and enhanced maps of many of the Banderas Bay areas. These maps are so detailed, indicating every street name, stairs, trails, pathways, and points of interest, that they are THE maps to have for anyone who enjoys walking. Jeff does much of his research by physically walking every inch of the area he is working on and taking detailed notes so when he gets back to his studio in California, he can produce these wonderful maps as accurately as possible. He updates the more popular Vallarta maps annually, reflecting the changes that have occurred during the year. Maps are coated to protect them from moisture, can be rolled for purse or pack, and can even be used as placemats or framed souvenirs from your travels around Banderas Bay. Couple these maps with my Walking Guidebooks, and you have all you need to strike out on your own and never get lost! Now also available, many of Mapa Jeff’s maps in foldable format for pocket, purse, or glove compartment. During high season, there are artisan markets every day of the week where local merchants gather to sell their wares in the old open market style of years ago. Typically there are from 40 to over 100 vendors in each market. Strolling among the tables one can find arts, crafts, farm fresh produce, flowers, homemade desserts and culinary delights, specialty breads, organic coffees, clothes, woven scarves and embroidered purses, handmade sandals and leather shoes, jewelry of all types, fresh juices, and on it goes. But what really makes this experience special is the people, both vendors and buyers. I have a table the Hotel Marsol Artisans Market near Los Muertos Pier Friday mornings selling my educational walking tours, guidebooks, hand-drawn maps, and photographs. Come enjoy the friendly atmosphere, relaxed conversation, have a cup of coffee and a scone, taste samples that vendors are passing around, listen to live music, read the local Mirror or Tribune and feel the warmth and laughter shared amongst friends.